When I visited my grandchildren’s school recently for a fundraising fair, members of the poetry club had set up a booth. 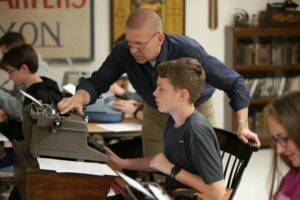 They offered to write a poem to your specifications, using — typewriters! First, of course, they had to learn how to use the typewriters. There is little to no time left. And there is excitement in the house. Is something special, made with love. There is even a subset of poems on the subject of grandmothers’ aprons. 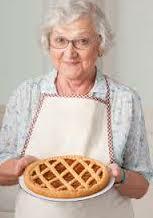 Full disclosure here: I had an adored grandmother who actually sewed aprons both plain and fancy, that constituted an important part of her meager retirement income. Decades later, we found that several of the fancier examples had been carefully preserved. But you don’t see me writing a poem about it, do you? And on for several stanzas. Clearly, for this genre, grandma equals love and giving and sweets and an old timey sensibility. What could ever be that good again? When are we ever, in real adult life, the recipients of food, devotion, and the warmth coming from the old wood stove? The answer, my friends, is never. Set the kids on stools so high. We dump the dishes in the kitchen sink.